Northwest China's Xinjiang Uygur Autonomous Region has planned to build the world's largest national park by integrating the scattered neighboring tourist resorts into a whole. The Kanas Geological Park, now around 1,000 square kilometers, will be expanded to about ten times larger in a few years after incorporating the nearby tourist regions and grassland, said Tan Weiping, head of the park administration committee. Tan said under a new tourism development plan, the Tiere Keti town of Kaba County and the Hom Kanas town of Burqin County will be included in the new national park, which s expected to replace America's Yellowstone National Park, covering an area of about 9,000 square kilometers, to become the world's largest. "The new national park is helpful to protect the unique natural scenery, wildlife and cultural relics here," said Tan. The local government has invested more than 8 million yuan (1.06 million US dollars) to map out the incorporation plan. Kanas geological park, almost 1,000 kilometers north of Urumqi, capital of Xinjiang Uygur Autonomous Region, boasts a range of landscapes, including the Kanas Lake, China's deepest alpine lake, snow-capped mountains and grassland. The park has attracted more and more tourists since it opened in the 1980s. It received 917,000 tourists in the first 10 months this year, a 32 percent growth over the same period of last year, and the figure is expected to exceed one million by the end of this year. 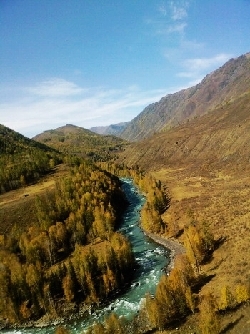 However, the booming tourism has also brought increasing environmental pressure to Kanas, which has also been called "the god's backyard" for its beautiful scenery. "Local residents have set up many wooden restaurants and family inns nearby the lakes and in the forests over the past years, which have caused pollution to the environment," said Tan. Under the new tourism development plan, the restaurants and inns have been demolished and will be removed to a new accommodation zone, which is about three kilometers away from the Kanas geological park and tourists can go to the park by shuttle bus.